The theme for today’s Step Ladder is polyominoes. In Scarabya players act as archeologists, on the hunt for priceless golden scarabs. These artifacts are buried at dig sites around the world and it’s your job to recover as many of them as possible. Each player begins the game with an identical dig site, selected at random by the start player. Each player also begins the game with matching sets of polyomino pieces. Players all act simultaneously, placing the exact same “dig” piece into their dig site based on a card drawn from the top of a deck. Each player must pull the matching shape from their pile and place it into their dig site, paying attention to a few rules. The very first piece placed must touch one of the 4 middle squares. All subsequently placed pieces must touch an existing piece on a flat side (corner to corner doesn’t count). Finally, no piece may hang off the edge of the dig site. After placing your piece, evaluate your dig site to see if you’ve fully enclosed one or more scarabs. If you’ve done so, score for each of them using the following rules. No enclosure larger than 4 squares may be scored. Scarabs score one point each, for each square within the enclosed area. If you have a single scarab in an 1 square area, it will be worth 1 point, while if you enclose 3 scarabs in a 4 square area, each of them are worth 4 points. Once the last card in the deck has been flipped, and the last piece placed in a dig site (or discarded), the game is over. Tally up your points and determine the winner! Trap 3 scarabs together in a 4 square area and you’ll score a sweet 12 points. 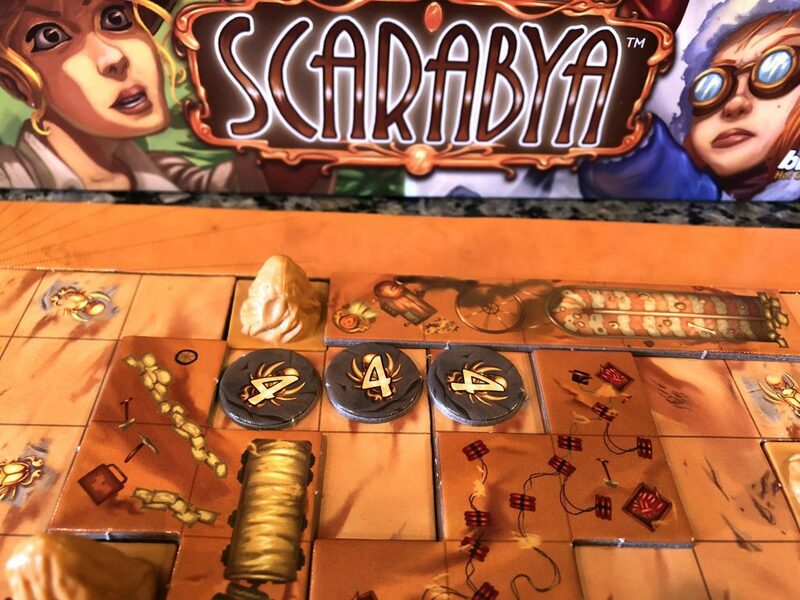 Scarabya is a wonderful family game. It offers just enough strategy that gamers of any level will remain engaged, but not so much that anyone will find it too challenging. The pieces are full of tiny details to discover, and the shapes themselves are appealing. It’s super satisfying to spend a few turns getting your dig site into a scoring state only to have the perfect piece reveal itself off the top of the deck; scoring you a bucket of points. 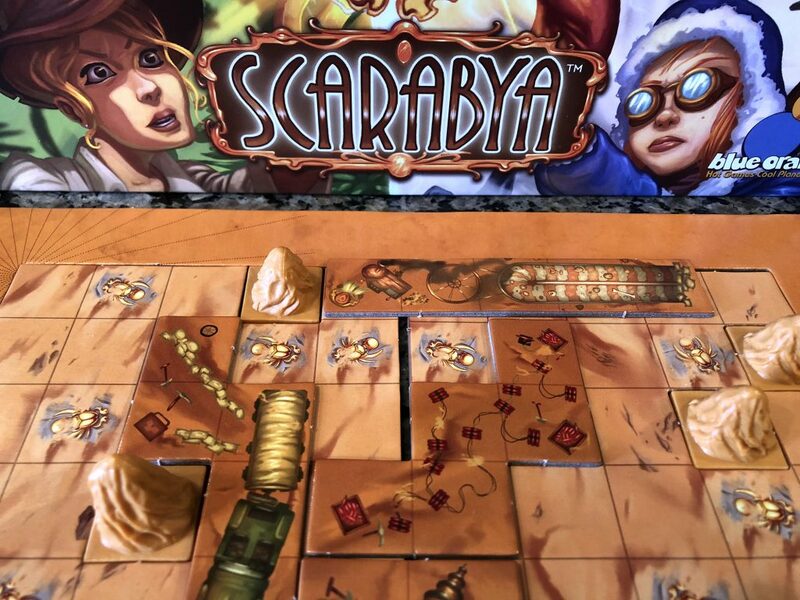 Scarabya also plays quickly which leaves you time for more gaming! Read our full review of Scarabya for more details. Heavy player interaction always ramps up the difficulty and that’s why Scarabya sits beneath the next game on this list. 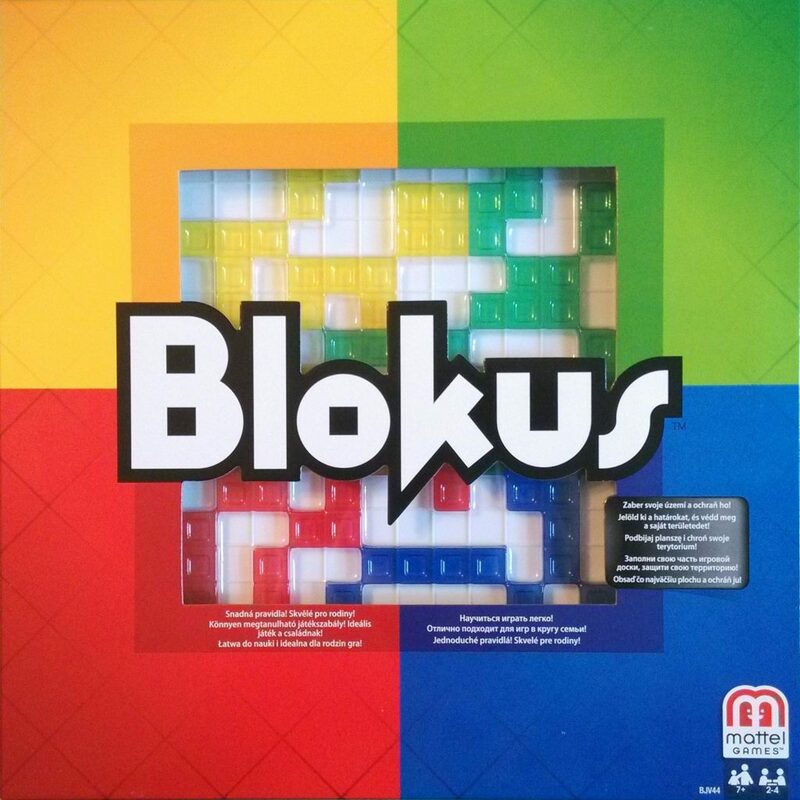 Invented by Bernard Tavitian and first published in 2000, Blokus has 2 to 4 players vying to place more of their polyominoes onto the board than their opponents. Each player begins the game with the same collection of 21 Blokus tiles. 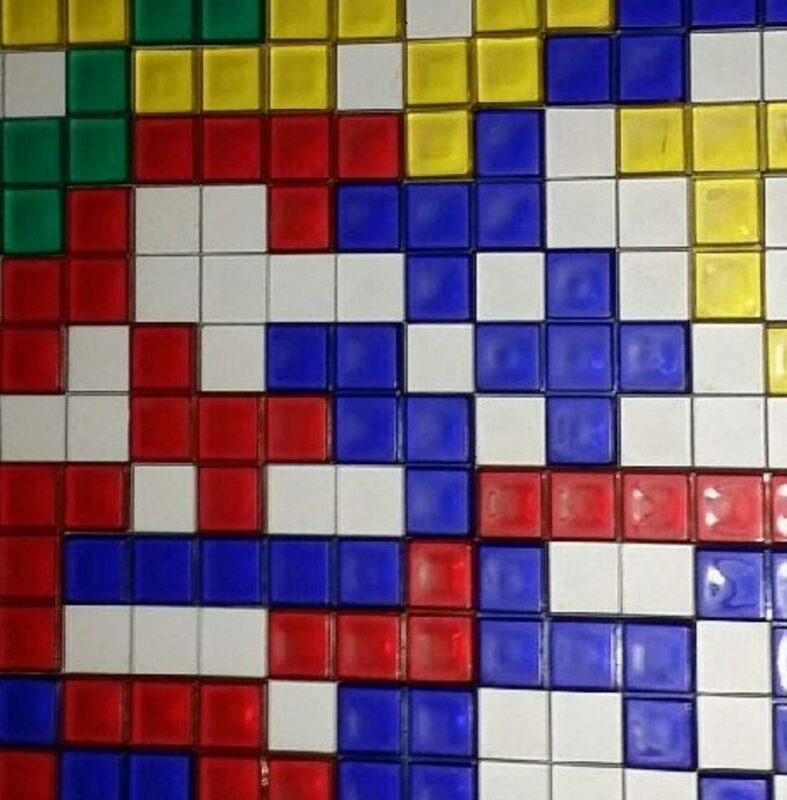 Each tile is a unique shape. 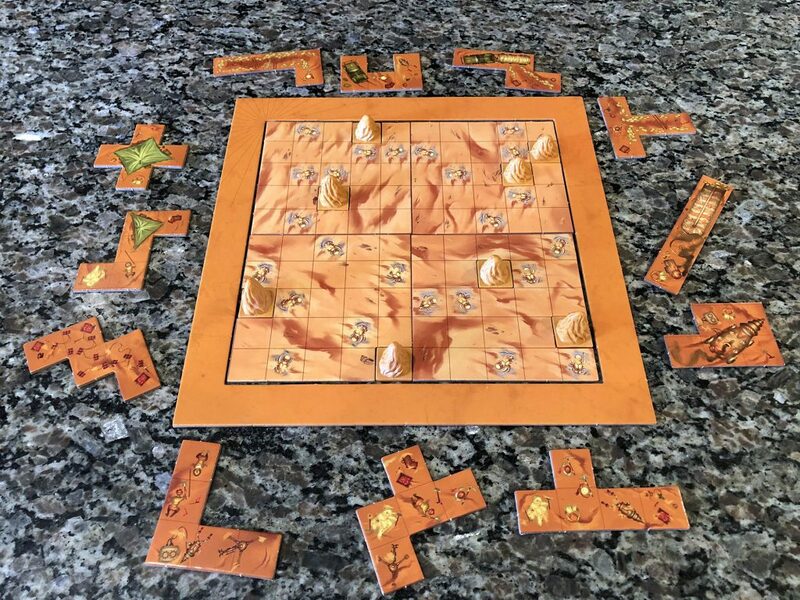 The players take turns placing their tiles into the playing grid following two simple rules: each piece must be placed corner to corner with another piece of the same color AND no two pieces of the same color can ever touch in any way other than corner to corner. While this sounds like a simple concept, it is anything but. At first, it’s easy to place things, but as players begin branching outwards, it starts to get crowded and finding valid placement locations becomes more and more difficult. Gameplay continues until no player has any valid placements left. Whoever has the fewest squares (the squares that each polyomino is comprised of) leftover wins. Blokus is a pretty fantastic game that’s a real brain burner. There’s a good reason that it was chosen as a Mensa Select game. The player interaction in this game is heavy and fierce. Players are trying to balance playing an offensive strategy – spreading out as much as possible to choke off space for their opponents to operate – with also trying to wall off an area for themselves to expand within. Blokus is area control at its finest. As challenging as Blokus is, though, it’s easy in comparison to the next game on our ladder. A Feast For Odin by Uwe Rosenberg is a game constructed entirely around the acquisition and placement of polyominoes. Each player begins the game with a player board that’s divided into a grid and covered with negative points. Using worker placement, the players send their Vikings out on quests to collect resources, purchase goods, and raid and pillage for valuable loot. With all of this talk about worker placement, you might be asking yourself, where are the polyominoes? Patience little Viking – those resources, goods, and loot come in the form of polyomino tiles which are placed onto the player board in order to alleviate those negative points, earn money and bonuses, and also earn victory points as well. This is, of course, a high level overview of the game and if you’d like to know more, then I suggest you check out our review of A Feast For Odin. Uwe Rosenberg is well known for his heavy, big box games. These games are typically very math-y by nature and most of them are very unforgiving. His games require you to always be as efficient as you possibly can with every move you make. A Feast For Odin is no different in this regard. It is inevitable that you and your opponents are going to get in each other’s way and it’s always a challenge to figure out how best to respond to these setbacks in your grand schemes. 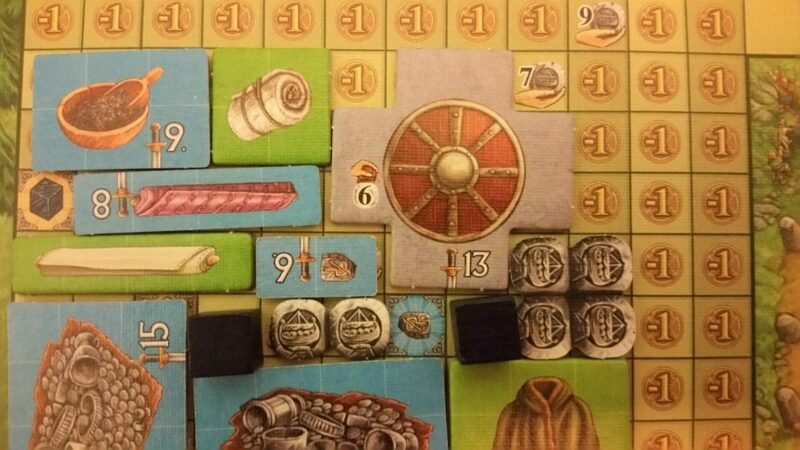 Thankfully, Uwe Rosenberg has engineered A Feast For Odin to be a little less brutal than many of his other games. Having to figure out a way to feed your people at the end of each round (which can equate into a ton of negative points at the end of the game) is not a difficult thing to accomplish in this game. The real challenge is trying to figure out a way to fill up your player board with as many polyominoes as possible before the game draws to an end. It’s an awesome game and a lot of fun, but man is it a heavy one (both in literal and metaphorical weight). Regardless of whether you’re an expert or just getting started, there’s a polyominoes game that’s right for you. What are some of your favorite games of this type? Let us know in the comments! I haven’t played a single Polyomino game, and I’m already tired of them.